Wedding bells were ringing this past October for our Scheme couples; Sandra and Li were one of those couples. 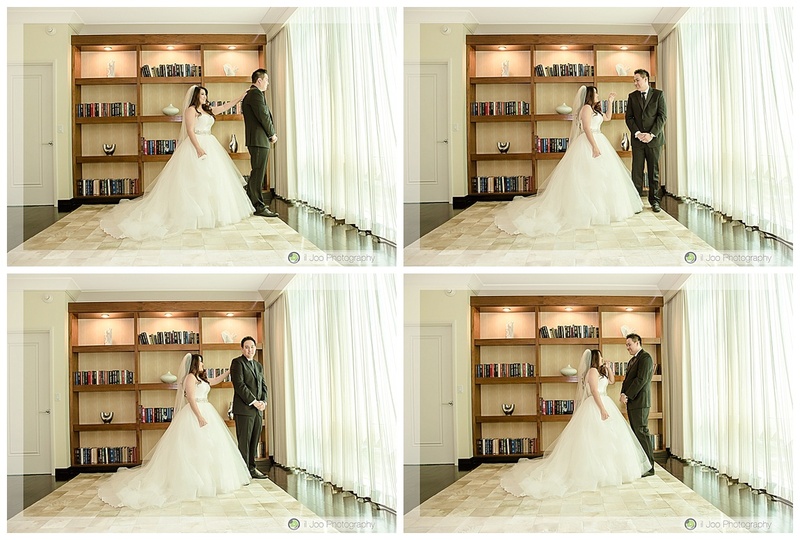 This beautiful couple committed their love to each other in the most beautiful way on October 22, 2015 at the oh so gorgeous DragonRidge Country Club. 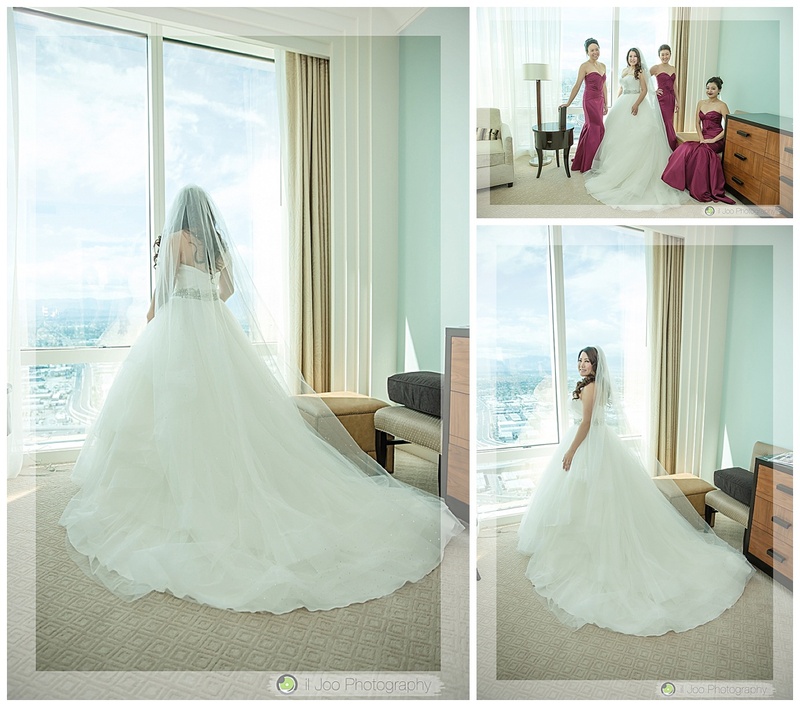 Scroll on through and revel in the beauty of this wedding as captured by Il Joo Photo & Mike Paragas. Sandra and Li knew that they wanted to show their guests a great time and celebrate with all of their friends and family over great food and a beautiful view. DragonRidge provided the perfect backdrop for their late October wedding with stunning city views and photo opportunities. 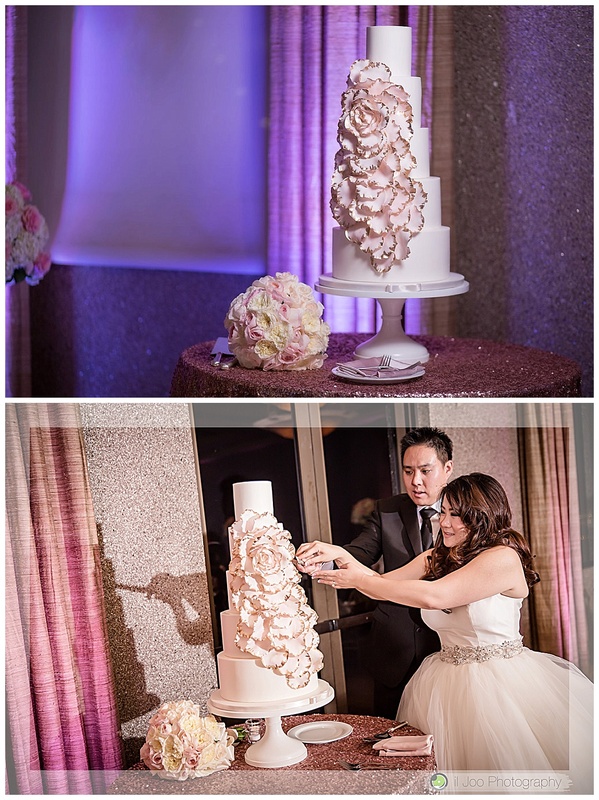 Sandra wanted to create a beautiful lush and romantic day with a mixture of pinks, whites and golds filled throughout the day. We couldn’t have asked for better weather on their wedding day with clear skies and a perfect temperature. 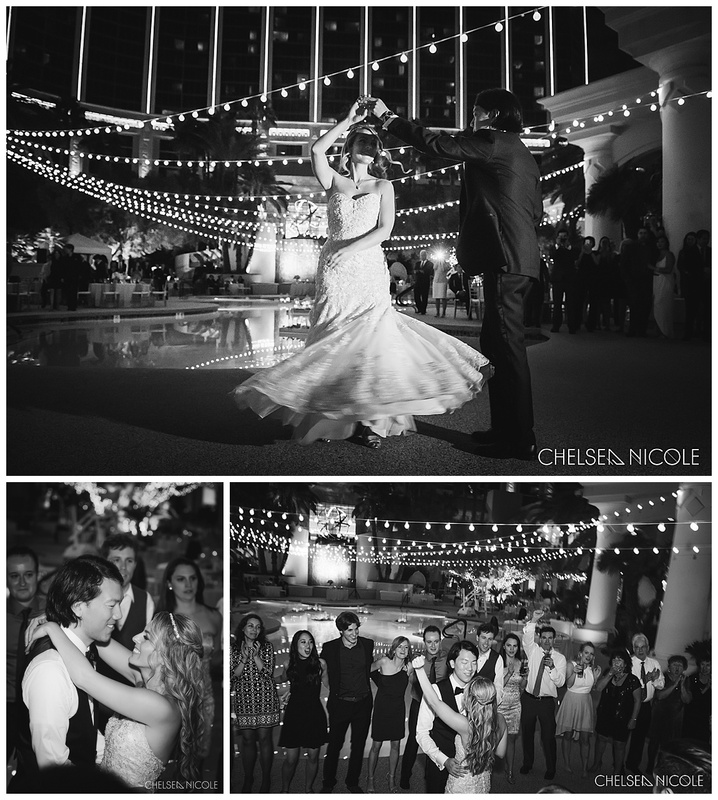 Their ceremony took place poolside and was filled with their closest family and friends. Large florals ran the length of the aisle as the bridal party and stunning bride walked down the aisle to the arch. 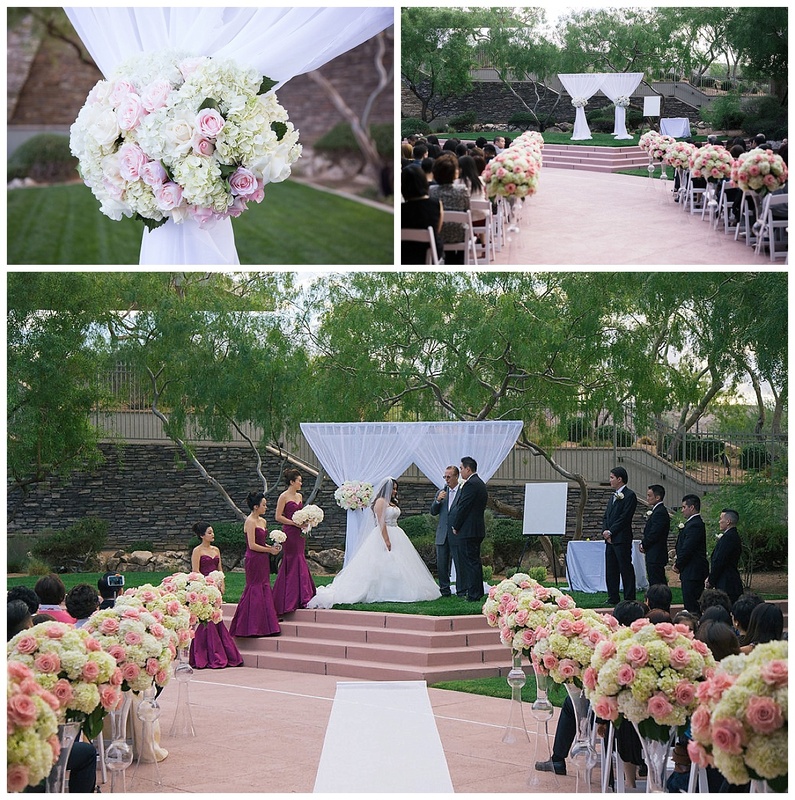 The ceremony arch was filled with flowing drape and floral pieces just as Sandra envisioned during the planning. 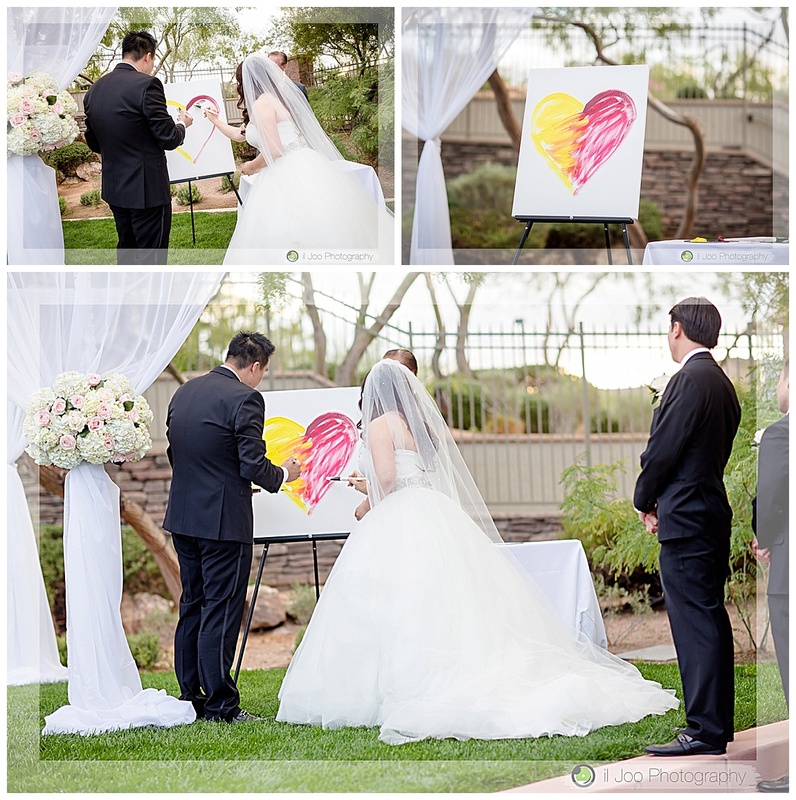 Visions came to life on this special wedding day. 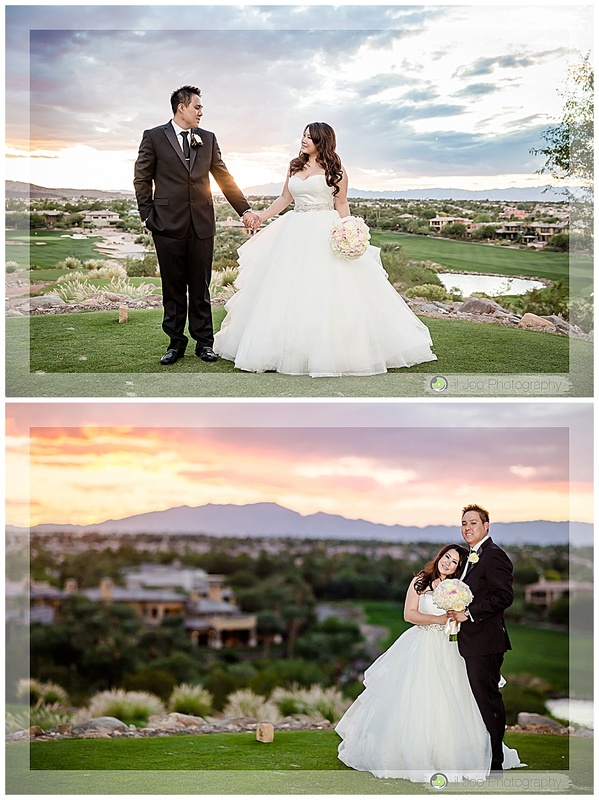 Following the ceremony, the bride and groom were whisked away to take sunset portraits throughout DragonRidge’s amazing golf course. Kyle of Il Joo Photo definitely captured Sandra and Li in some amazing light. Guests were enjoying cocktail hour filled with passed appetizers, specialty cocktails and Korean rice cakes. Moving into the reception, guests were seated at different sizes of tables with textured linens and floral pieces and candles galore. You can never go wrong with a blush sequin linen and a large tall centerpiece atop or a petal ivory linen filled with candles and long and low floral pieces. The perfect backdrop was created for the remainder of the evening for laughter and lots of dancing. 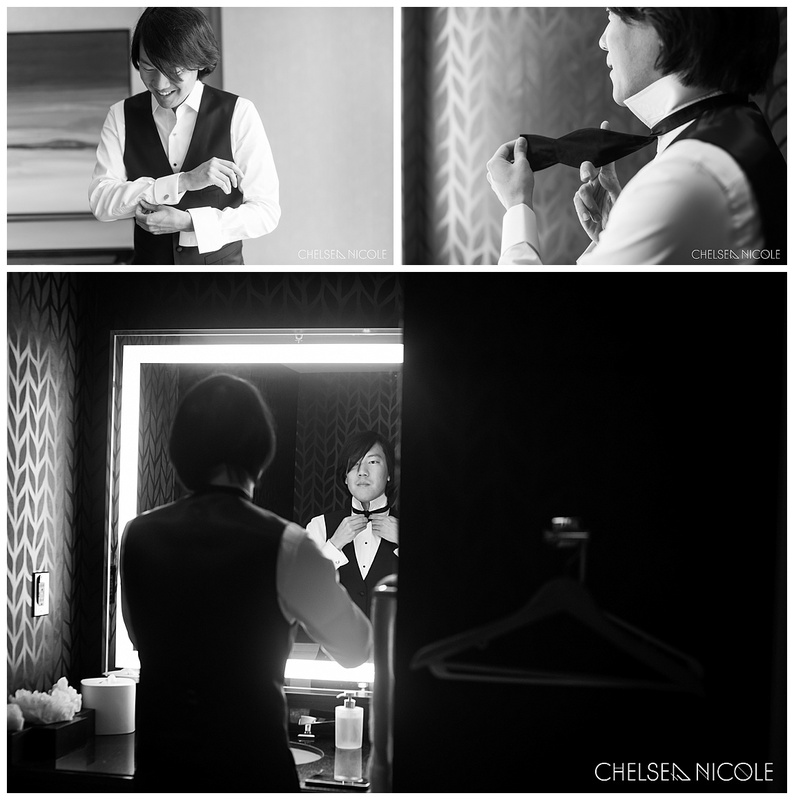 Sandra and Li– it was a pleasure planning with you and your wedding day was nothing short of breathless. 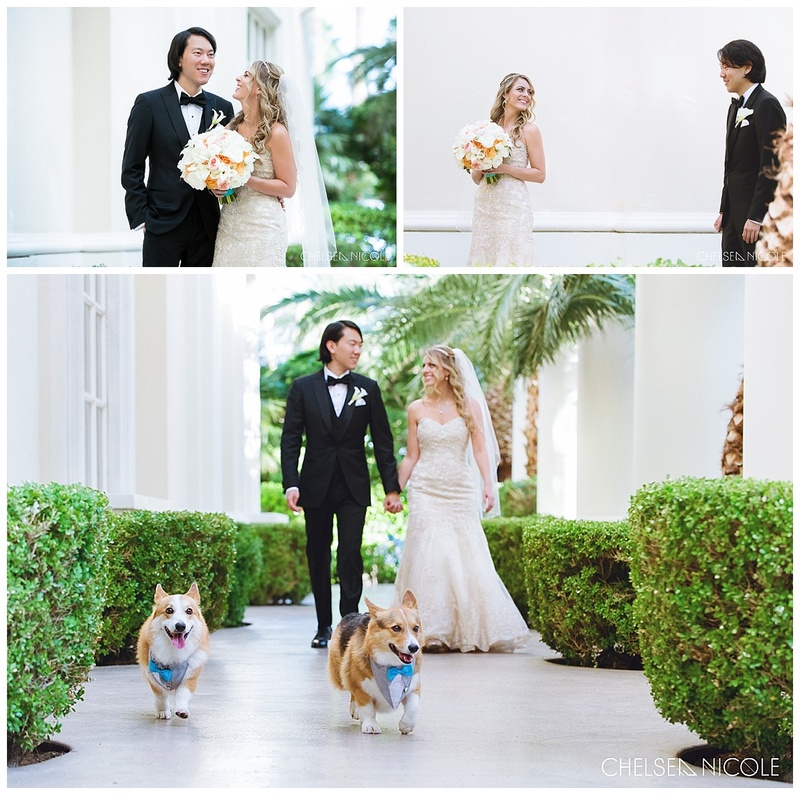 I wish you both a lifetime of happiness, love and lots of memories created in your home here in Las Vegas. Cheers to you both. xoxo! I have a soft spot in my heart for weddings that take place outdoors. And I mean the whole thing — ceremony, cocktail hour and reception. 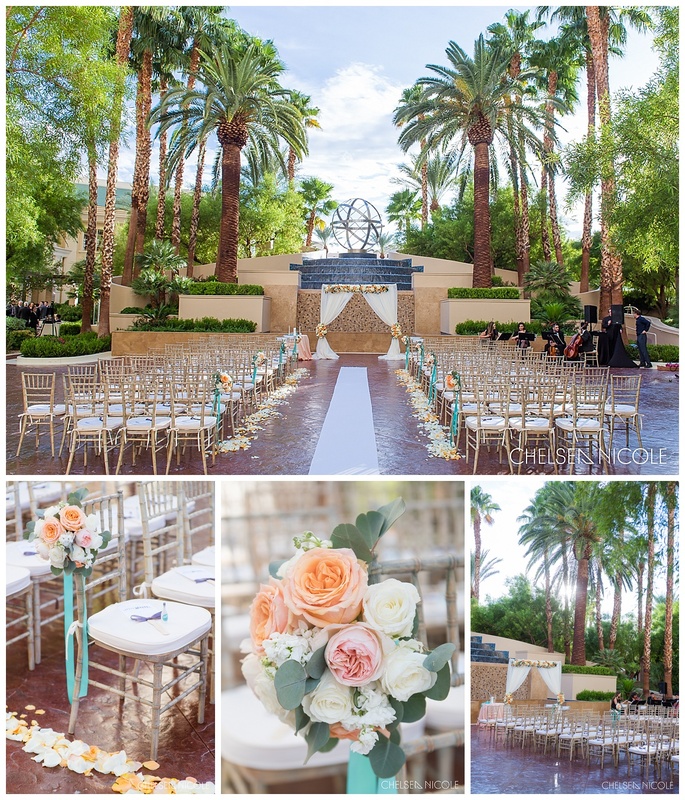 I love the feel of an outdoor wedding and when Joni & Erick wanted a poolside wedding in Las Vegas I couldn’t wait to start planning with them. 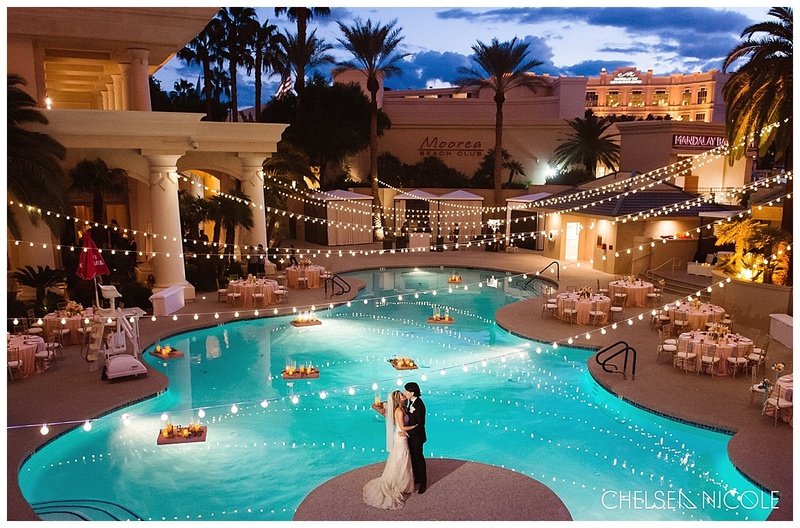 We choose the Four Seasons Las Vegas to host their wedding, because…well, it’s the best pool in town! Joni had clear ideas of what she wanted but needed help taking those thoughts and turning them into a wedding. She knew she wanted her dogs involved (check them out below!). 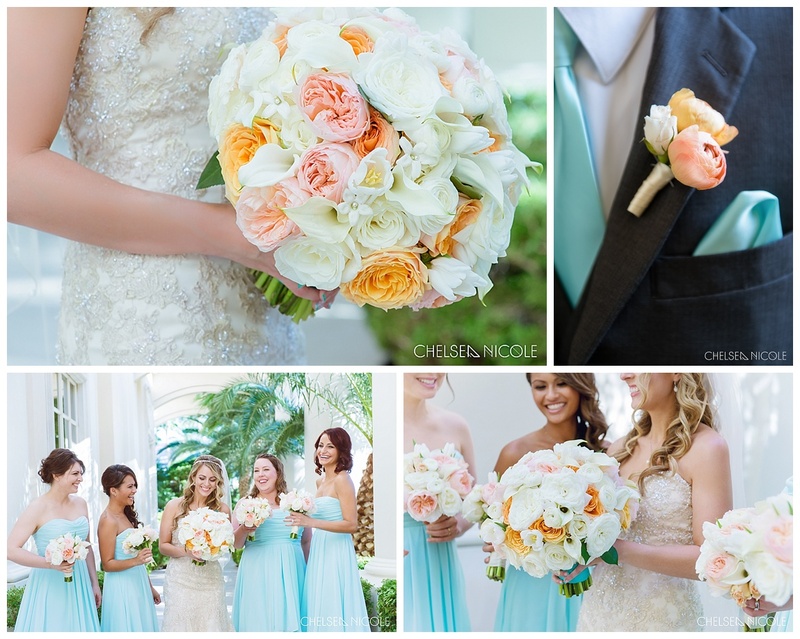 She wanted to incorporate their love for video games and she wanted her favorite colors of teal and peach. Given this direction, I set out to plan a day that incorporated all of these elements and had a romantic, elegant feeling. We used peach linens on the reception tables with florals of ivory, blush and peach. 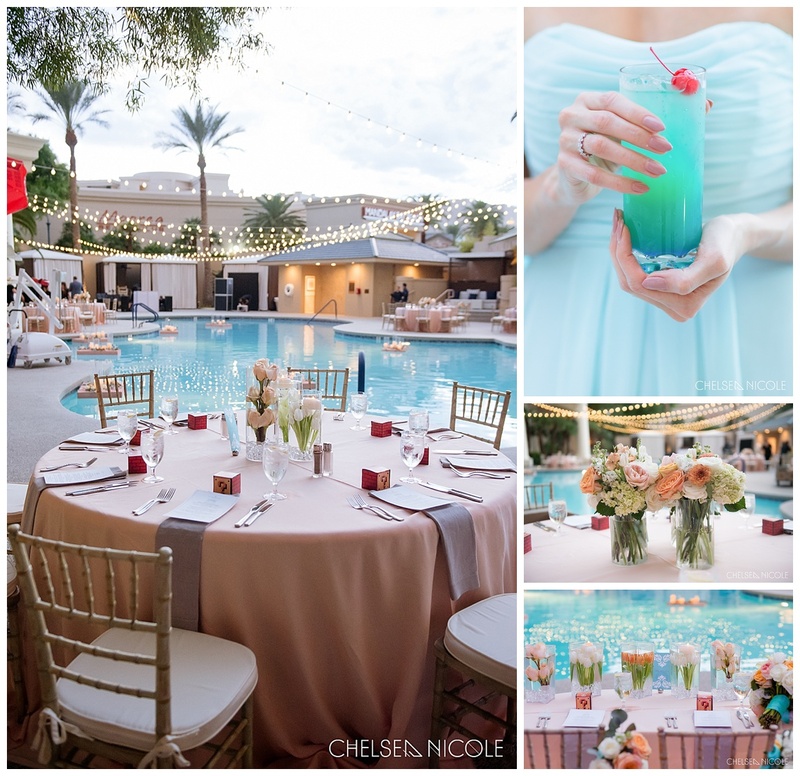 The teal influence came from the bridesmaids and the pool. White-washed, beach inspired chiavari chairs were perfect for the pool setting. As the wedding day approached, the weatherman was forecasting some serious thunderstorms. We’d had great weather all Fall season and were not expecting rains to ruin an October wedding! We kept on top of weather reports and waited until the day before at wedding rehearsal to make the call. Joni and Erick had both been envisioning a wedding at the pool and wanted to do whatever it would take to make the wedding happen outdoors. I was so happy with their decision. Moving an outdoor design into a ballroom is never good news to a wedding designer and I knew it would be beautiful if we could just get Mother Nature to cooperate! On the day of the wedding, signs pointed to a rainy evening. We followed doppler reports and kept on top of multiple sources for updates throughout the day. Before noon we had to make 1 final call to stay outside and risk the rain, or move indoors and play it safe. Joni stuck to her guns and called for outdoors! And Mother Nature must have been listening because we lucked out and had an absolutely gorgeous evening. We were threatened for about 15 minutes with sprinkles here and there, but the dark clouds eventually passed.